Our 4 compartment sinks are great for your toughest cleaning tasks. Whether you need a drainboard model or a stainless steel utility or prep basin, we've got the right model for you no matter your budget! 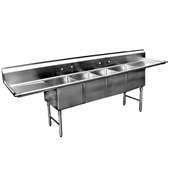 Choose from our wide variety of stainless steel sinks to meet the needs of your foodservice business to complete your dish washing process.